Anyone who has owned a Fox Body, SN95, truck, etc knows that the 8.8 rear axles in late model Fords are stout pieces from the factory and can be really strong with the right parts. Stock they come with 28 spline axles which aren’t going to cut in a real performance application, but there are lots of aftermarket axles, C-Clip Eliminator kits, and more that will beef them up. There are cars running in the 8’s on them at the dragstrip and they are virtually identical to a 12-bolt Chevrolet rearend in size, shape, etc. And while there are plenty of ways to swap one into other projects by grabbing a housing from a Ranger, F150, Mustang, Etc, they do require a little homework and legwork in order to put a combo together that will fit under your ride, and then it’s still built with original Ford materials. Well those days are gone because Moser has just introduced the new Moser M88! 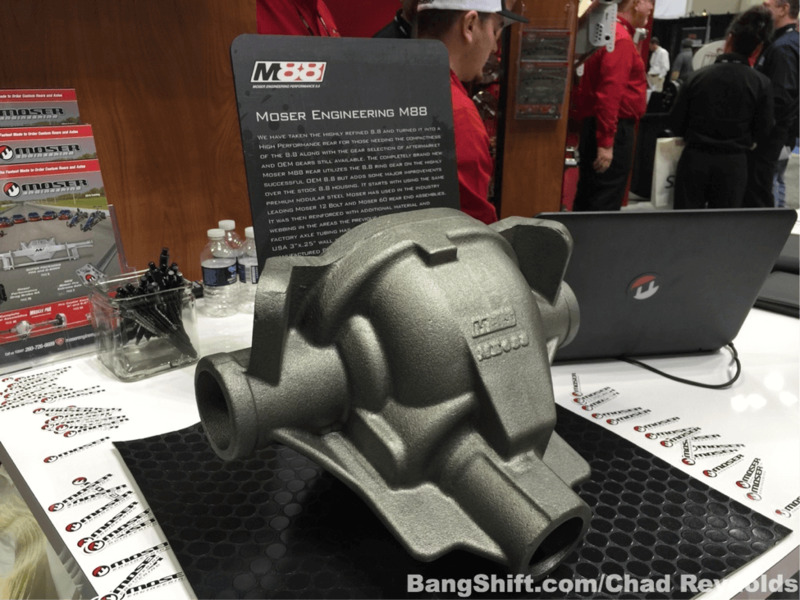 Thanks to the fine folks at Moser you can now get a brand new 8.8 Ford rear axle center section that is cast from the same Premium Nodular Steel that Moser uses in their 12-bolt and Moser 60 center sections and they are available with or without the ears cast into them that are normally used for Fox body and Mustang applications. Improvements also include additional webbing, much stronger main caps, and additional oil flow for the bearings, cooling and longevity of the gear set. This is the M88. Axle tubes of much higher quality 3 inch .250 wall DOM standard, and they can be made in any width you like. Moser can also put any bracketry you like on them whether you are setting your ride up for factory suspension systems from Ford, GM, or Mopar including link style and leaf springs. And if you are going to be running your car with Ridetech Street Challenge suspension they can even install the Ridetech brackets for you right from the factory! Hell, if you want to run a 4-link, 4-bar, or whatever they can help out by installing those brackets as well. The sky is the limit. Like a 12-bolt GM rear axle assembly, the Ford 8.8 is a C-Clip axle from the factory and that isn’t the strongest setup. But instead of having to install a C-Clip Eliminator kit to go to a retained bearing style axle like a 9″ Ford has, you can order your Moser M88 with any axle housing ends you like. We recommend the Big Ford 9″ ends as they can handle ANY power level and will live forever while keeping your wheels still firmly attached to the axle in the event you do break something inside. This isn’t very likely as you’ll be able to now step up to much bigger axles rather than the stock 28 splines that come installed stock in an 8.8 from Ford. Our buddy Jeff Smith once wrote a story on the 8.8 and how great they can be to swap into older hot rods, regardless of make, and we have to agree.